The Adder is Britain's only poisonous snake. It favours heathlands, hedgerows, open woodland and river banks. It emerges from hibernation in March when temperatures rise above 9°C and the males go in search of females to mate with. Rival males will fight over a female, the loser's head gets forced to the ground and he will then move away to find another female. Young adders are born live in late Summer and stay with their mother for just a few days. Adders will only bite people if they are disturbed or attacked and will not actively seek to bite a person. They are carnivores, and bite small mammals and lizards to inject their venom. After a short while the venom immobilizes the prey and the Adder will then seek it out by smell and devour it. 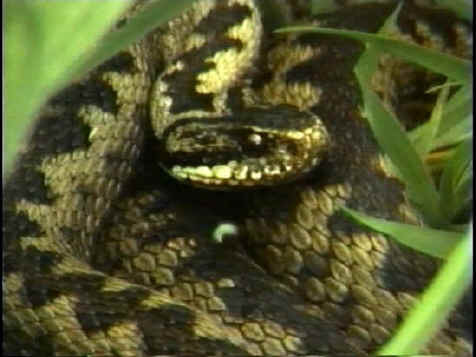 This method saves the Adder having to use excessive energy struggling to subdue its prey. Just how poisonous is an adder?